The setting is the Deep South in 1959. What began as scientific research ended up changing his life in every way imaginable. When he decided the real story was in his journals, he published them, and the storm that followed is now part of American history. As performed by Ray Childs, this first-ever recording of Black Like Me will leave each listener deeply affected. John Howard Griffin did the impossible to help bring the full effect of racism to the forefront of America's conscience. If you could sum up Black Like Me in three words, what would they be? The shoe shiner. He was one of the few that got what it was all about. Have you listened to any of Ray Childs’s other performances? How does this one compare? No.. But this one was great. Very easy to listen to. Every person should read this to see how to avoid perpetuating racial issues that have no rational reason to exist. It also shows me that fighting hate from the whites with hate, just makes every one evil. Jesus' way of doing good to those who use you and hurt you, is clearly the only way this kind of thing can be fixed entirely. memories of the growing up in the very racially segregated rural South with Jim Crow laws that would not allow my black friends/neighbors to go to the same school, use the same public restrooms, drink from the same public drinking fountains, and eat in the same restaurants as me. It brings back memories of this wonderful book.and memories of meeting and talking with John Howard Griffin. And memories of losing my signed copy from the original run of this beautiful book years later during a move. Finally, it brings back memories of the KKK burning a cross in our yard 30 feet from our house in June of 1955 just before my 12th birthday to warn us to stop associating with our closest neighbors and friends who happened to be black. For more than 50 years I have cherished Black Like Me and spending some time discussing his experiences with the remarkable man who wrote it. I was active in civil rights demonstrations at the time. As I look back at the impact of the book and of our participation in in the cause of ending racial segregation and Jim Crow laws, it strikes me that our efforts were a miniscule portion of promotion of necessary changes. That also applies to the book. As much as Griffin was exposed to discrimination by most white people he encountered in the deep US South and the horrid inconveniences caused by Jim Crow laws because of the color of his skin, he also found that the discrimination was not universal; there were also acts of kindness from many of those white people. When I first read Black Like Me it represented the world that existed in the South at that time. It's power now is as a raw document of history written at the time it was happened. The book is also a powerful statement of the courage of one person among the multitude that through their combined efforts changed laws and a system that discriminated against people because of the color of their skin. In the end, the major power of Black Like Me is that it tells a historical story in a way and with a power that is unmatched by that in history books. What a fantastic book! Had this in my audible library and finally got around to reading it. First of all, it was hard to believe that you could physically transform a white man to a black man, but I've seen the before and after pictures online and it was amazing. Secondly, the various situations he encountered were almost unbelievable. From a man who picked him up while he was hitchiking, primarily to ask him about his genitalia, to the shoe shine man who didn't realize he was the same guy before and after, the stories in this book are simply astounding! Third, it is also curious as to how dangerous an undertaking this actually was. Can't believe he came out physically unscathed, although there are some close calls in the book. (However, after the book was published, he and his family had to flee to Mexico due to death threats). Like "Uncle Tom's Cabin", this is a must-read and really points out how it feels to be on the "other side". Highly recommend!!!! As a white woman who decided to read and learn more about black history, the finding of this book was purely accidental, but couldn't have been more appropriate. At first I thought I was going to find this tedious, but once I gave in to giving this timeless piece work a fair chance, I was engrossed. I learned much and my perspective was broadened immensely. After further investigation, this book is often used in the academic setting. After experiencing this incredible tale of a timeless social experiment, I feel it should be mandatory reading in the academic setting. Absolutely breathtaking and I have not remorse for experiencing this book. Conversely I have an enormous gratitutde for the opportunity to experience this marvelous piece of literary work. I loved... LOVED... listening to this book. The story is amazingly interesting (especially for social scientists who study race in America). But the reason I took time to write this review is to comment on the narrator's performance. I cannot imagine another person doing a better job. I am now a total fan of Ray Childs; I just wish there were more selections read by him. If you find the description of this book the least bit interesting, you won't regret spending time with it. Does everything a good book should do.. This book makes you stop, think, and question. It stays with you, haunts you and makes you reflect on yourself and how you treat others. I stumbled upon this little gem quite by accident as I was looking for books which addressed social justice for a graduate course. I was astonished. Griffin has gone above and beyond to explore racism. This story takes place in the 1960s and is told from his experiences. He chemically and medicinally darkens his skin to become a black man. His experiences are heartbreaking. He witnesses both kindness extended by complete strangers and chilling cruelty from neighbors. I won't give spoilers or too much detail as you must listen to/read this book for yourself. A touching, poignant story of one man's incredible courage to move outside the realm of the "known" in order to discover the truths of racism and ignorance ingrained into Southern society. Growing up in Kentucky in the 60's, I witnessed many of the tragic and gut-wrenching scenarios described in his journey. A brilliant social experiment that exposes the lies of what some believe is "equality." A reminder to us all to keep ourselves in check when dealing with people of different races, religions and nationalities different from our own. Excellect, the best book i have read for years. It shows how far we have come in such a short time but it also shows how much further we have to go. The book is a must not only for Americans (I am not American) becuase the world must stop judging and start embracing. This book was required material for some high schools in Canada. I feel like it should be required material for every high school student in the United States. Would you listen to Black Like Me again? Why? I read the book as it had been recommended to me by another book. The book was written around 1959 and it takes you in the deep South. I was not surprised about the attitudes, the racism and hardship that the author had to go through, but still somewhat shocked in regards to some folks behavior. We do live in a different day and age. I did not read this book for pleasure, so to speak, but definitely learned something from it. If you are into this genre, this book is an interesting and it seems very truthful. I would recommend the book for those reasons. I would not read it again. It is somewhat dated and not entirely accurate, or rather, fitting for this day and age anymore. Given the time frame and the history at that time, I must say, the author did a pretty good job describing his own adventures and elaborating on his feelings. There were many good characters in the book. This is not really a book where you would get character development as in a story, this is more about getting to know people how they really are and react when the rubber meets the road. What about Ray Childs’s performance did you like? It was ok -nothing great, nothing too annoying. The book was well worth the $5.95. Great if you are a history teacher and want to teach this topic. Packed with cuss words though. 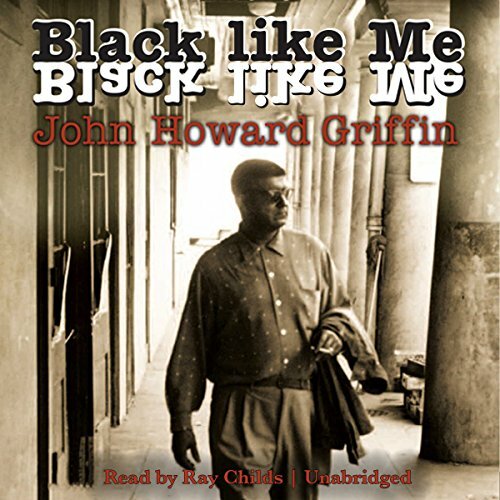 Would you consider the audio edition of Black Like Me to be better than the print version? I never read the book but feel that they would have been on an equal par. I found the very poor young man with his wife and children living in the forest to be my favourite character because I remember a young man in South Africa some years ago saying to my father that had he broken down in a rural area, he would have taken him in and given him what food he had and a place to sleep but it would not have been the same if the young man had broken down in a "white" area. I really found the whole situation the same as I had known it then. What does Ray Childs bring to the story that you wouldn’t experience if you just read the book? I think that Ray Childs brought a good narrative voice and quality to the reading, which brought my imagination to life in many ways. His voice brought the whole situation to life. Man's arrogance in thinking that he has the right to judge and see himself as superior to anyone. I loved the book. For me it was a confirmation of what I thought was happening in America in that time period. I had also seen this in South Africa, and in later years as well until Mandela's government took over. I was able to see a lot through this book which I had only thought and believed happened. Excellent listening - great narration! Read this at school in the lates 70's. As a black pupil in a mainly black class I was really fascinated by the unusual storyline and was really anxious to get through to the end.I wasn't disappointed at all.Since rediscovering it, have recommended to others, black and white! What was one of the most memorable moments of Black Like Me? There is plenty of bleak humour in this book. One of the most grimly funny exchanges was when Griffin was discussing visiting a church and then in the same conversation asked where he could find the closest of the very few "black" toilets. The other man asked him if he wanted "to pray or to piss" and then observed that since there were so few such facilities available for the use of black people in town, he would spend most of his time "praying for a place to piss". He read the narrative well. It's a short book but couldn't be read properly in one sitting because there was too much to think about. An important historical document, absorbingly well told.